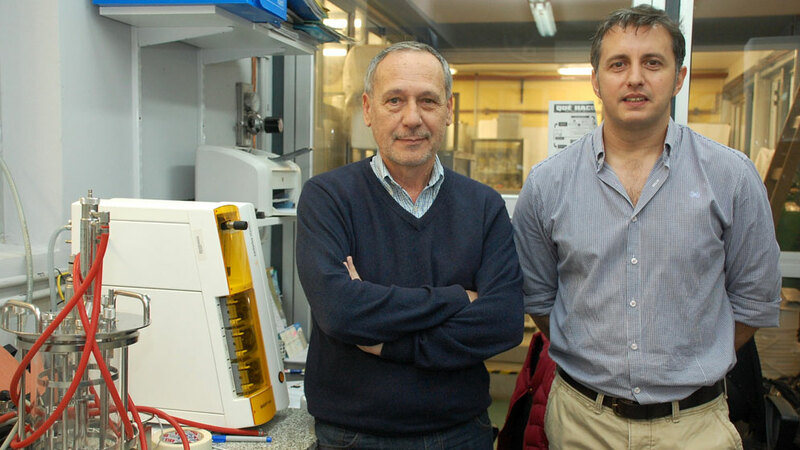 Researchers from CONICET and INTA study the production of native bacteria cultures from spray drying, a widely installed technology in the country. Jorge Reinheimer, CONICET senior researcher and director at the INLAIN and Gabriel Vinderola, independient researcher. Photo: courtesy researcher. Human beings have groups of microorganisms in different parts of the body. Some of them live in the bowel, which houses a population of bacteria called gut microbiota. Humans acquire it after birth and later on its composition undergoes modifications after labour, during the baby’s diet and it is also modified by maternal microbiota. One of the microorganisms that form it are the bifidobacteria, a vital genus of bacteria that help digestion, which are beneficial for treatments for diarrhea and constipation, and they also modulate immune responses, among other benefits. Besides, they can be cultivated and used to produce functional food with probiotics. “In our country, probiotics have been intensively used for twenty years. In 1995, cultured milk appeared and then probiotic cheeses began to be produced. All cultures commercially used in Argentina are imported and they are sold either frozen or freeze-dried. For this reason, the Instituto de Lactología Industrial (INLAIN, CONICET-UNL) [Institute of Industrial Lactology] together with a group of professionals of the INTA EEA Rafaela aim to promote the development of probiotic cultures from isolated strains and characterize them locally. Besides, the objective is to find a technological tool to produce it using the infrastructure installed in the country: spray drying”, says Gabriel Vinderola, independent researcher at the INLAIN. The chemist explains that some of the most industrially used microorganisms are Lactobacillus Casei and Bifidobacterium animalis subsp. Lactis. In the industry these species are regarded as robust and easier to handle, and their use for the production of cultured milk, yogurt and cheese with probiotics is widespread in the market. In general, these cultures are produced by lyophilisation, a procedure in which a cell concentrate is frozen and water is removed by vacuum. “Spray drying, the most widely used alternative technology to dehydrate, is not suitable for every strain and that is a significant limitation. Not everything that can be lyophilized can be dried through spray to obtain the same results. However, we noticed that this technology is widely used in Argentina, at all scales. If we find something that can be dried through spray, that can pave the way for large scale production of some probiotic culture that we could develop at that scale”, the researcher comments. Spray drying is a commonly used industrial technology to obtain solid particles from a liquid. The process involves the pulverization of the fluid into small droplets within a chamber under a controlled stream of hot air that dehydrates it almost instantaneously. The researcher explains that the studies on probiotics began to be focused on the microbiological composition of the breast milk because it was considered as the functional food par excellence. In 2003, two research teams in Spain and Finland simultaneously published the appearance of potentially probiotic species of lactic bacteria in breast milk: Lactobacillus rhamnosus and Lactobacillus casei. The focus then shifted to the study of breast milk for its potential industrial use. “Breast milk transmits bifidogenic factors but; to whom does it transfer them? And which bifidobacteria will make good use of these factors? The answer appeared some years later when one group of scientists found bifidobacteria in breast millk. The bifidobacteria the mothers transmit to children during lactation lead to the early colonization of the intestine and immune maturation of the child. Nowadays, we know that the probiotics we isolate from the intestine, fermented food and also breast milk are a source that transmits naturally bacteria with functional and technological interest. In 2008, with the help of an obstetrician from the province of Santa Fe, we managed to obtain samples of women who were breastfeeding; and through isolation it was possible to determine that they belonged to a highly technologically adapted species: Bifidobacterium animalis subsp. lactis”, Vinderola states. Once this group was isolated, scientists began to analyze their functions in vivo. The researchers based their study on the presumption: if nature selected and transferred them to the baby, there must be a reason for that. They started with a technological study that allowed having the three strains of three different analyzed species. Nevertheless, only Bifidobacterium animalis subsp. lactis maintained high levels of viable cells after lyophilisation and a simulation of gastric digestion. Besides, they formed good pellets, which are small portions of compressed material. “We began to put the ones that could be lyophilized in some babies’ food in order to see how they reacted to those food matrixes. We noticed that the high level was maintained both at cero time and after a month; and when we conducted the simulated gastric digestion, some food proved to be really capable of protecting them. As the results were fine, we wanted to go beyond: to develop a pilot plant and reach the industry”, the researcher adds. With that objective, the scientists conducted tests in a company that produced spray drying in the country in order to test the method in bifidobacteria. Those studies showed that the microorganisms could have technological potential so they are currently being studied with a local industry to produce biomass at an industrial level and the subsequent industrial spray drying. Furthermore, the researchers study the effects of the strain in vivo in murine models. Vinderola explains that they observed that in mice provided with bifidobacteria increased intestinal defences and modulated intestinal transit. The second analysis was focused on the reaction of the animals against infection with pathogens such as Salmonella. Those ones who received the bifidobacteria were less infected and only the liver was colonized, whereas those that did not consume probiotics were mostly infected and had both the liver and the spleen colonized by the pathogen. With this long research, in 2008 the INLAIN began to isolate and characterize bifidobacteria strains that had positive effects on intestinal health and technological capabilities for production at a great scale through low cost and available technology in the country, such as the spray drying. These strains will encourage the development of national probiotic cultures to promote the intestinal health of their consumers. “The INLAIN witnessed the development of the industry and market of probiotic food, so we noticed what worked, what not, and what is the trend in technological, microbiological and functional aspects. We should try to study probiotics from all points of view: if I focus only on technology, I will not be able to know if the microorganism is going to maintain its properties. If I conduct studies only in the laboratory without considering what is going to happen with the industry, I can have a bad experience, for instance microorganisms can immediately dye when transferred to dairy or dehydrated products”, the scientist affirms.